We also offer you a fabulous gift wrapping service. We will wrap your purchase in top quality paper and handwrite your special message on a matching gift card. You can choose to have the gift delivered to your own address or direct to the recipient. Full details can be found at the checkout when you have selected your purchase. Gift wrap costs £5.00 per item. Choose from Pretty, Trendy or Hearts wrap, or Christmas paper (available from November). 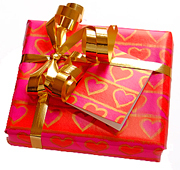 Trendy Gift Wrap is a gloss black wrapping paper and we will use either gold or silver ribbon for men and sometimes pink/red ribbon for ladies. Hearts Gift Wrap, in pinks and reds, perfect for Valentines Day and other occasions. Please do not select this gift wrap for large items as the sheets are not big enough. It's perfect for purses and smaller items. Christmas Gift Wrap: choose from a sparkly silver paper with a snowflake design or a cream paper with red foil reindeer design.